Has the Blazers center supplanted CJ McCollum? The Portland Trail Blazers have bounced back from their slump in late November and early December, winning seven of their past 10 games and nine of their past 14. The Blazers have been led by Damian Lillard, who has played at an All-NBA level all season, and Jusuf Nurkic, whose historic 5x5 game Tuesday against the Kings highlighted a short run of impressive play for the Blazers center. Over the past four games, Nurkic has averaged 21.5 points, 13.0 rebounds, 5.3 assists, 1.8 blocks and 1.8 steals in 31.5 minutes per game. This week’s podcast focuses on whether Jusuf Nurkic is the second-best player on the Blazers, what’s going on with the slumping CJ McCollum, and how Portland will fare on their upcoming five-game homestand. 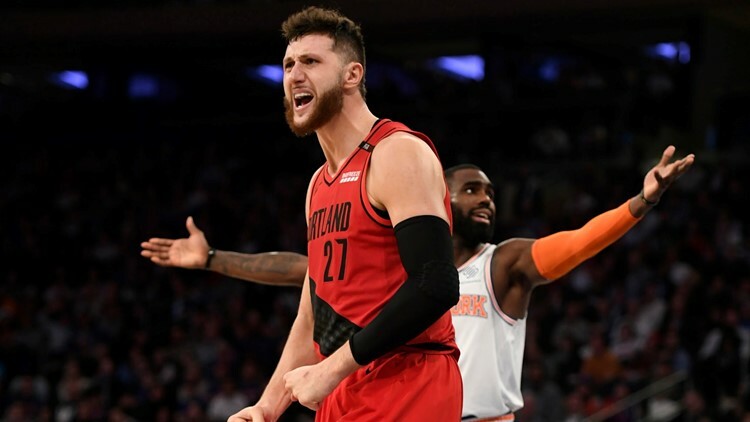 LISTEN: 3-on-3 Blazers: Is Jusuf Nurkic the Blazers' second-best player? 1. Jusuf Nurkic made NBA history Tuesday against the Kings, tallying an unprecedented stat line of 24 points, 23 rebounds, seven assists, five blocks and five steals. Blazers fans are giddy for Nurk right now. Has Jusuf Nurkic supplanted CJ McCollum as the second-best player on the Blazers? And where would you rank Nurkic among centers in the NBA? Nate: I’m not going to go as far as to say Nurkic is Portland’s second-best player. Although he has played very well recently and may be turning a corner, I need to see a larger sample size before declaring he’s better than CJ McCollum. With that said, I think Nurkic is the second-most important player on the Blazers. So far, this season can be split into three parts for Portalnd: the 10-3 start, followed by 5-10 stretch, and the most recent 7-3 run. During those first 13 games, Nurkic was extremely efficient offensively. During the 15-game slide, his efficiency and field goal percentage dropped. But during this recent 7-3 stretch, Nurkic’s offensive efficiency is higher and his assists are way up. In fact, in the last 10 games Nurkic and Lillard are tied for the most assists per game. As Nurkic has played better, the Blazers have had more success as a team. You can’t say the same thing about McCollum this season. MCollum’s best stretch of shooting came during the 5-10 rough patch. League-wide, I’d rank Nurkic in the 6-10 range among best centers. Jared: Well, it’s either Jusuf Nurkic or CJ McCollum. Let’s look at the data. Nurkic leads McCollum in the following categories: offensive rating, defensive rating, net rating, plus-minus, assist percentage, steal percentage, block percentage, offensive rebound percentage, defensive rebound percentage, total rebound percentage and true-shooting percentage. McCollum leads Nurkic in assist-turnover ratio and effective field-goal percentage. If you look at ESPN’s real plus-minus, an all-encompassing analytic that incorporates defensive performance into the equation, Jusuf Nurkic currently ranks 12th overall in the NBA (+4.18), sandwiched between Kevin Durant and Mike Conley. McCollum, meanwhile, ranks 139th (+0.04), sandwiched between Derrick Rose and Iman Shumpert. McCollum is better on offense and Nurkic is better on defense, but the gap between the two on offense is much more narrow than the gap on defense. Looking at offensive real plus-minus, McCollum ranks 38th in the NBA and Nurkic ranks 80th. In defensive real plus-minus, Nurkic ranks sixth in the NBA, while McCollum ranks 444th. Only one of these two players gets it done on both ends of the court and that’s Jusuf Nurkic. So yes, in my opinion, he’s the second-best player on the Blazers. As for Nurkic’s ranking among centers, that’s harder to quantify. Nurkic ranks third in real plus-minus, but I’m not quite that high on his status among centers. I think the following players are better than Nurkic: Nikola Jokic, Rudy Gobert, Joel Embiid and Marc Gasol. I think Nurkic falls into the next tier, with Karl-Anthony Towns, Nikola Vucevic, Andre Drummond, Steven Adams and Clint Capela. I’d rank Nurkic somewhere between 5 and 10 in NBA center rankings. Orlando: Rip City is flirting with a second case of “Nurk Fever” and his insane stat line at Sacramento, did it. It’s been a steady brew over the past four games. He’s averaging more than 21 points and 13 rebounds in those games and he’s been a double-double machine over the past month or so. The Blazers are 7-3 over their past 10 games and Nurkic has made a major impact on the trajectory of the team. Over the past month or so, Nurkic has been more important to the team's success than CJ McCollum has, but I’m not ready to say he’s now the second-best player on the team. I need more consistency from Nurkic before I’m ready to give the big fella the nod. The Blazers took advantage of some recent mismatches in the post against the Warriors, an Embiid-less 76ers and the Kings, but I can’t ignore a couple of games against the Jazz and Grizzlies where he didn’t have it. McCollum is still averaging 21 points per game and shooting 46 percent from the field on an offense that still starts with ball-dominant guards. McCollum also has a better offensive rating than Damian Lillard does right now. Let’s see what Nurkic does in the next couple of games against teams with legit big men. Nurkic is on his way but he’s not there, yet. 2. Speaking of McCollum ... He's a career 40 percent shooter from 3, but this season he's shooting 33 percent, a career-low. He's also averaging the fewest assists per game (2.5) since he became a starter in 2015. What's up with CJ? Jared: A shooting slump is what’s up with CJ. In October and November, McCollum shot 40 percent and 35 percent from the 3-point line, respectively. Not quite up to his normal standard, but good enough. In December, though, he shot only 29 percent from the 3-point line. McCollum is missing shots. That’s not a big concern, though. McCollum has enough of a track record as an elite shooter in this league that a shooting slump, even one that’s lasted this long, shouldn’t cause too much consternation. The same can’t be said for the rest of his game, though, especially as a playmaker and defender. McCollum’s assist averages have decreased every season since he became a starter in 2015, from 4.3 to 3.6 to 3.4 to 2.5. Part of that can be attributed to his change in role this season (he’s no longer running the second-unit offense), but part of it is that he's simply not making the plays for his teammates when they're there. McCollum’s defense is as bad as it's ever been. This season, he ranks 444th in defensive real plus-minus with a mark of -1.86. The three seasons before, McCollum ranked 483rd (-2.04) in 2017-18; 426th (-1.87) in 2016-17; and 196th (+0.05) in 2015-16. McCollum had a breakout season in 2015-16, but he’s regressed every season since. Orlando: McCollum is in a 3-point shooting slump, one of the worst of his career. He told Jason Quick it hasn’t been this bad since he was in high school. McCollum went through a similar struggle last year around this time too. His free-throw efficiency is down too. Shooters go through it and that’s his greatest strength. It is affecting other parts of his game as well. Before the season began, McCollum talked about taking the next step and becoming an All-Star. Expectations have changed for him and in the eyes of fans and that’s why you’re hearing more from the “trade CJ” crowd. He’ll turn things around with his 3-point shooting, it’s part of the game, but the same deficiencies in the Blazers' backcourt still exist. Defense has to get better. If Portland plans to silence critics and win some playoff games, the team can’t do it without McCollum snapping out of it. Nate: I think the narrative around McCollum’s scoring this season is a little misguided. Yes, his three-point percentage is way down. He’s talked about he feels he’s shooting with a locked wrist at times this season. So, I think it’s something more mechanical than anything. But McCollum is still scoring at the same rate despite the 3-point struggles. So, how is that possible? He’s converting more of his two-point opportunities. His offensive rating this season is the highest of his career. Although he’s not knocking down three-point shots, he’s still finding other ways to score for Portland. And that’s the player he is. He’s not a good defensive player and he has never excelled at getting others involved on the offensive end. I get that this is a 3-and-D league and McCollum hasn’t fared well in either of those aspects. But he’s a scorer who can create his own shot with the best of them in the NBA. And he’s still finding a way to have an impact offensively. 3. The Blazers begin a five-game homestand Friday. They welcome the Thunder (24-13) on Friday, Rockets (21-15) on Saturday, Knicks (9-29) on Monday, Bulls (10-28) on Wednesday and Hornets (18-19) on Friday. This week’s question is an over-under: 3.5 wins for the Blazers on this homestand. Orlando: Portland has been tough to beat at home, sporting a 14-6 record at the Moda Center and they’ve got a chance to put together a nice win streak. I expect wins over the Knicks, Bulls and Hornets. All three of them are terrible road teams, it would be a disappointment not to get all three of those wins. The question is, can they beat OKC and Houston to open this homestand. The Blazers have owned the Thunder recently, winning six straight. I think the defense of Maurice Harkless and Al-Farouq Aminu will be a problem for OKC, helping to limit Paul George from going off. I’ll take the Blazers to win that game. The Rockets are in a groove. They’ve won five straight and nine of their last 10. James Harden is playing like a man possessed and playing at an MVP level. Houston gets the W for the second time this season. That’s 4-1 this week, so I’m taking the over. Nate: Over. The Blazers have taken care of business this season at home and I expect that to continue. Although Oklahoma City has been impressive so far this season, the Blazers seem to have their number. So, I’m going to pick Portland to win a close one at home. A back-to-back against the Rockets and red-hot James Harden will be too much for the Blazers to overcome. And the Blazers exhale from their difficult stretch with three wins over the weaker Eastern Conference teams. Jared: I’ll take the over, for three reasons. One, the Blazers are good at home, with a record of 14-6 at the Moda Center. Two, the Blazers have been good at beating up on inferior opponents, going 10-6 against teams currently with losing records this season. The only bad loss was to the Washington Wizards. The other five losses are to the Grizzlies, Mavericks, Jazz and Timberwolves, all legitimate playoff contenders. Three, the Blazers tend to split games against teams that are on par with them or better. Against teams currently with winning records this season, Portland is 12-10. So, based on those three factors, I expect Portland to split the first two games and win the final three games, giving them a 4-1 record on this homestand. I’ll pick the Blazers to beat the Thunder at home, lose in the back-to-back against the Rockets, and then beat the Knicks, Bulls and Hornets.